A Sunrise Mimosa is the perfect way to enjoy champagne in the morning! 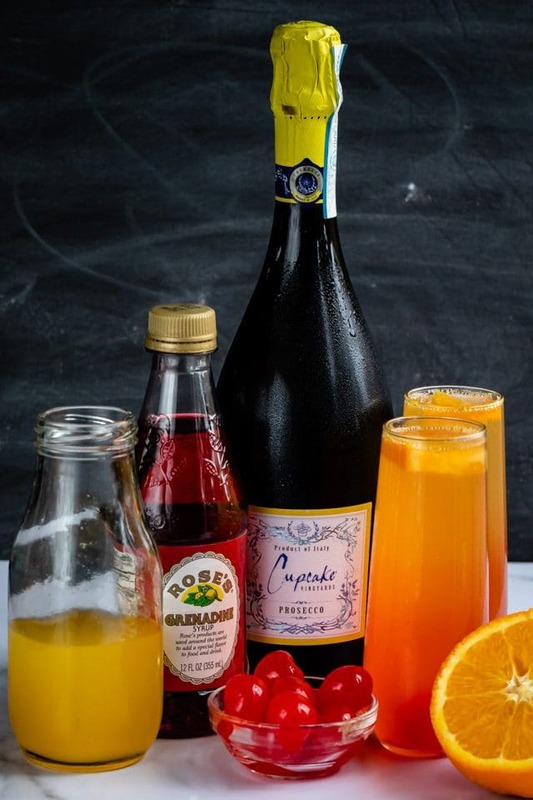 Just three ingredients: champagne, orange juice and grenadine make this the perfect mimosa recipe for any occasion! I love how pretty a Tequila Sunrise is; the layers of orange and red. It makes me think about summer and the beach and it makes me thirsty too. The only problem with a Tequila Sunrise is that tequila and I…we just don’t mix. We used to be friends until one night in November a few years ago when he just took advantage of me and since then we’ve been way on the outs. 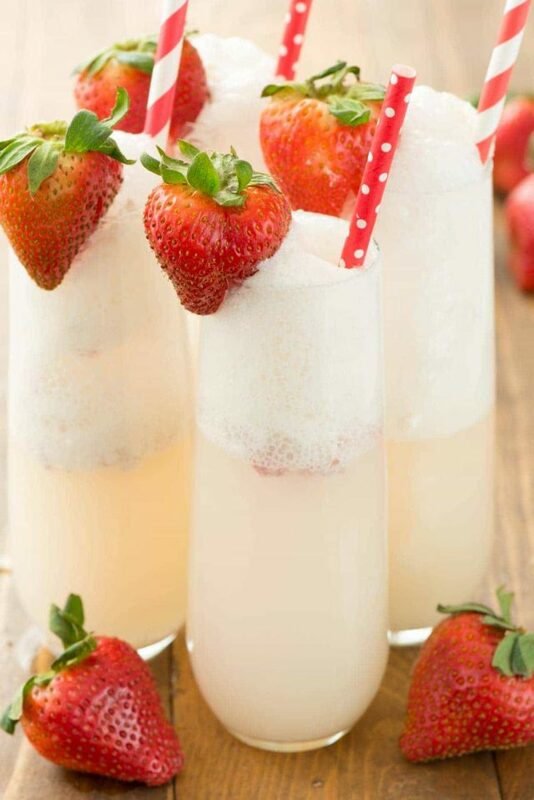 I’m really angry about that because I love margaritas and these fruity sunrise drinks, so I decided I had to make them in a new way: with champagne! 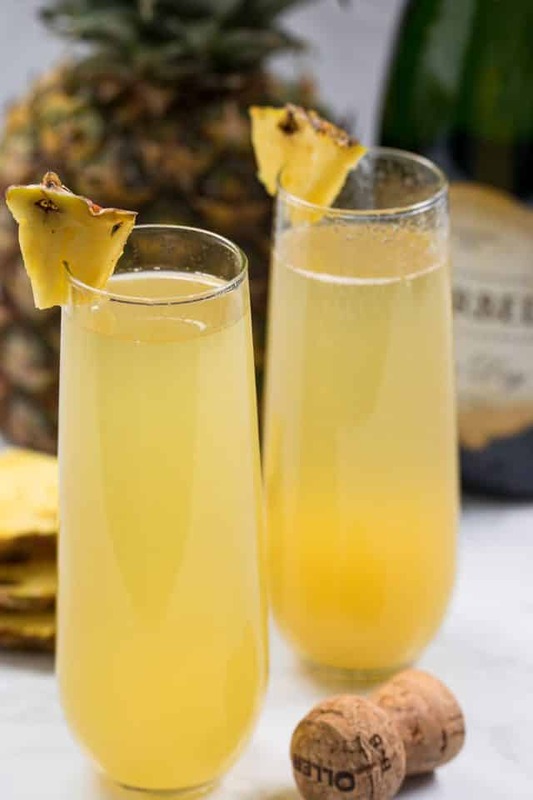 I turned your favorite tequila cocktail into a MIMOSA! 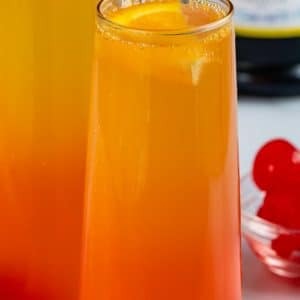 A Sunrise Mimosa is an easy three ingredient cocktail with orange juice and cherry. Its pretty and pretty darn tasty too! 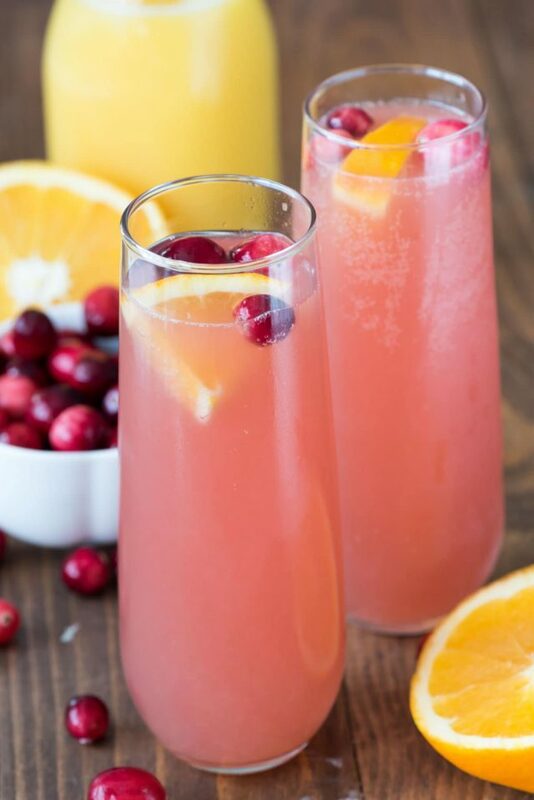 Whether you call this a Mimosa Sunrise or a Sunrise Mimosa, you can have the flavor of your favorite beach cocktail without the tequila…and since this is a mimosa you can have it for breakfast. Mimosas are perfect all year long, but especially in spring. Between Easter and Mother’s Day the bubbles are flowing this time of year! I’m going to go out on a limb, as a mom myself, and tell you that your mom (wife, sister, daughter) most likely doesn’t care about brunch for Mother’s Day. What she really wants is a mimosa and some free time. Since most of you reading are probably moms, maybe just send this post to your significant other or your (adult) kids. And…even if you have to throw a brunch…make yourself a mimosa first. Have you ever wondered how to make the best mimosa? You can make the best mimosa by using flavors you love. 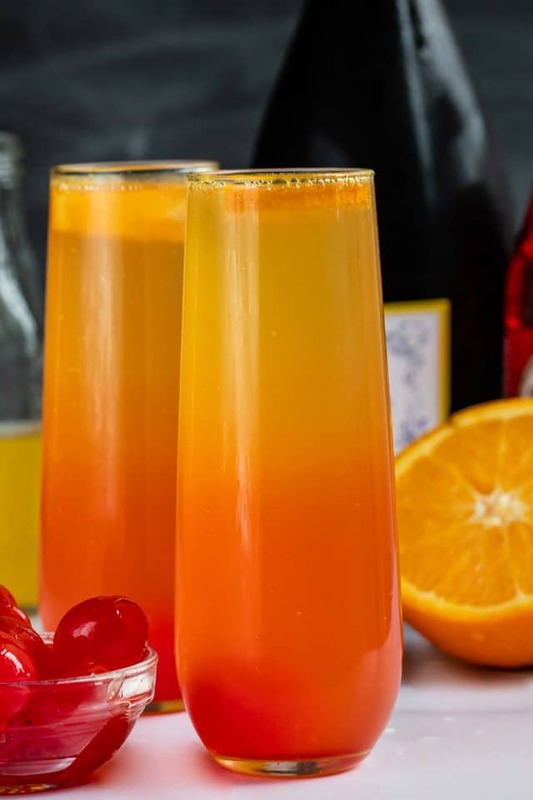 If you love orange juice mimosas, then this Sunrise Mimosa is for you. 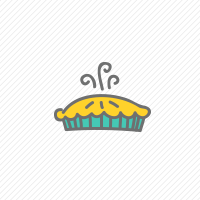 Maybe you prefer cranberry or apple, or maybe even strawberry! Use the ratio of juice to champagne that you like best. Me? I’m a 90% champagne and 10% juice girl (or maybe 99:1) but others might like it weaker with more juice. Make them how you like them. What kind of champagne is best for mimosas? Honestly you should use what you like best, but I recommend using a Prosecco or a Brut champagne. You don’t want anything too sweet, since you’re adding juice. My mimosas are usually Prosecco Mimosas, but use what you like! Mimosas taste better when you use orange juice from the grocery store, but fresh is ok.
Start with ice cold champagne and orange juice. To get the sunrise effect in your mimosa, pour the grenadine slowly down the side of the glass. It’ll pool in the bottom. Don’t have grenadine? Use the juice that’s in the maraschino cherry jar. For one: Add chilled orange juice to champagne flute. Top it off with champagne. Drizzle a bit of grenadine along the edge of the glass to create the two-toned affect. Garnish with an orange slice and cherry. For a pitcher: Add chilled orange juice to pitcher. Top it off with champagne. Drizzle a bit of grenadine along the edge of the pitcher to create the two-toned affect. Garnish with orange slices and cherries.